“The Will to Adorn: African American Diversity, Style, and Identity” is a project that “explores the diversity of African American identities as expressed through the cultural aesthetics and traditional arts of the body, dress, and adornment.” Aside from background research of various cultural traditions and styles and crafts that pertain to clothing, jewelry, and even tattoo art, much of the information collected are oral testimonies from individuals describing what they are wearing at that time, why they chose to wear it, what certain articles of clothing mean to them, and how it fits in with their communities, immediate or diasporic. The project also seeks to fill significant gaps in the SI collections where stylistic examples, collected from “African American ‘artisans of style,'” should be. The term ‘artisans of style’ refer to shoemakers, hatters, and other craftspeople who make clothing representative of African heritage. While the project intends to fill gaps in our understanding of how diverse African American communities express identity and a sense of community through dress, it also carries with it deeper meaning. Its namesake is an observation made by Zora Neale Hurston, who was herself an anthropologist. According to the project website, Hurston once observed that ‘the will to adorn’ ranks among the most important manners in which African American communities express identity, ideas, and cultural knowledge. Such information transmitted through dress has been filtered through centuries-worth of experience, influenced in part by the legacy of slavery and of social, political, and cultural movements to claim agency and control in every aspect of daily life. In the spirit of Hurston’s observation, this project’s creators and supporters view every day dress as one such act in claiming identity. The project is therefore more than a tool; it is a platform on which individuals and communities can preserve the profundity that is woven, beaded, sewn, and threaded in one’s choice of dress. The anthropological lens of “The Will to Adorn” bifurcates people’s dress into a reflection of contemporary culture and a link to the history of crafts and the craft of history, a craft that every person engages with whenever they reach into their wardrobe. While the website contains significant detail about the project and purpose of the app, the app is relatively simple and, for lack of a better phrase, gets the job done. It is also free to download, which makes it accessible to anyone with access to a smartphone. What is your inspiration for how you are dressed? What do you consider to be the most important part of looking good? Describe what you are wearing today. What does what you are wearing say about who you are? What would you never want to wear? Why? Once finished, the app will provide an opportunity for you to make your recording, to listen to your recording, to re-record yourself speaking if you would like to change your recording, and to upload your recording. 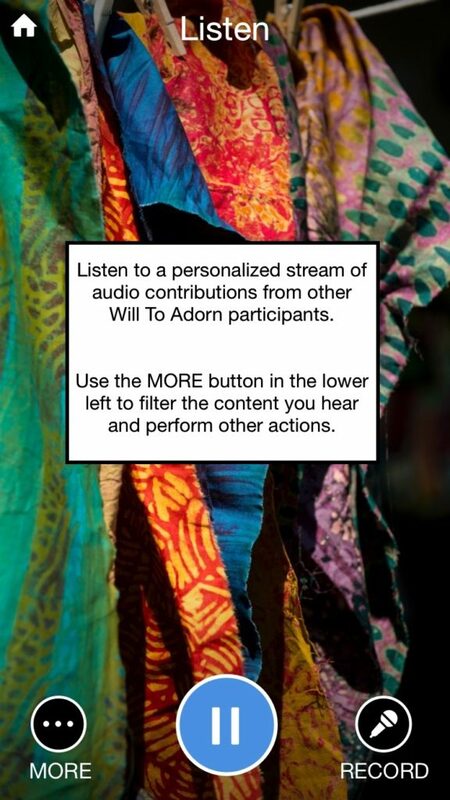 Selecting the “Listen” option brings you to a page on which recordings collected since 2013 begin to play. Pressing “more” brings you to a series of criteria that allow you to limit the types of recordings that you would like to hear. For example, you can listen to recordings by individuals of ages between 20 and 29, by males and trans individuals, individuals from the Midwest and Mid-Atlantic regions, and by individuals who chose to respond to the “What does what you are wearing say about who you are?” prompt. 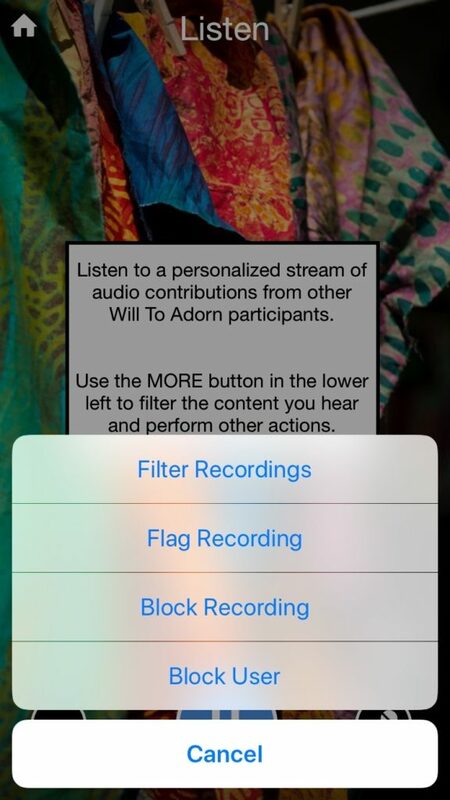 Selecting “apply” will make a playlist of recordings by individuals to whom those criteria apply. Note: no recordings fit all of the above criteria in my example, so if you fit those criteria, make a recording! The SI wants to hear what you have to say about the choices you make about what to wear and why you wear it. Together, these features make it more likely that users and contributors will return more than once, perhaps even regularly if they are so inclined. But therein lies a problem. Unless the user is particularly fond of the project or interested in its content, there is little chance that he, she, or they will continue to use the app or add further descriptions of their chosen outfit to those which have been collected since 2013. Nevertheless, the app does the job it was created to do. “The Will to Adorn” sits at an odd but noteworthy intersection of sweeping trends in historical study such as the spatial turn and the digitization of museum collections. 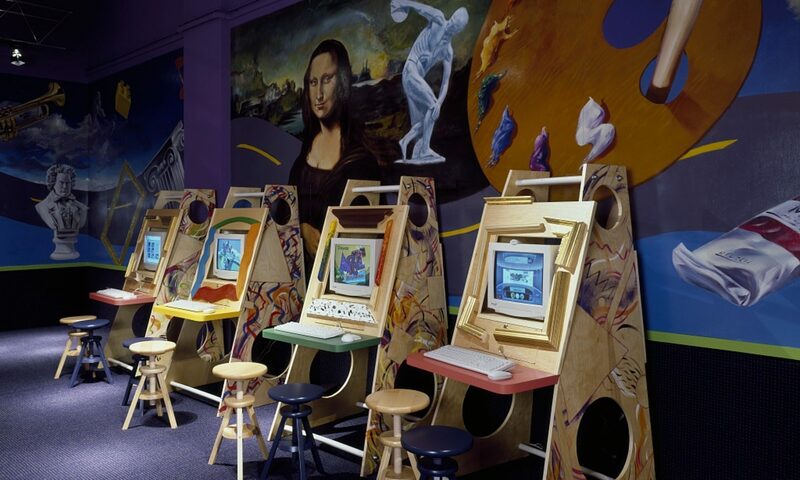 The app is unlike others by cultural institutions which are themselves intended to orient the user in spaces in ways they may never would have considered. As John Russick observes, most cultural museums using AR to share collections to wider audiences have relied on overlaying images of objects on maps relevant to those objects. “The Will to Adorn” has no maps. The closest it gets to orienting the user within a set space is by asking where he, she, or they is from, or by allowing listeners to hear recordings provided by contributors from specific regions in the U.S. The app combines the crowdsourcing method of collecting with methods in oral history that allow the user to place themselves within those broad geographies, which are spatial, as well as within space demarcated by a certain diasporic community, which is less concretely spatial yet spatial nonetheless. 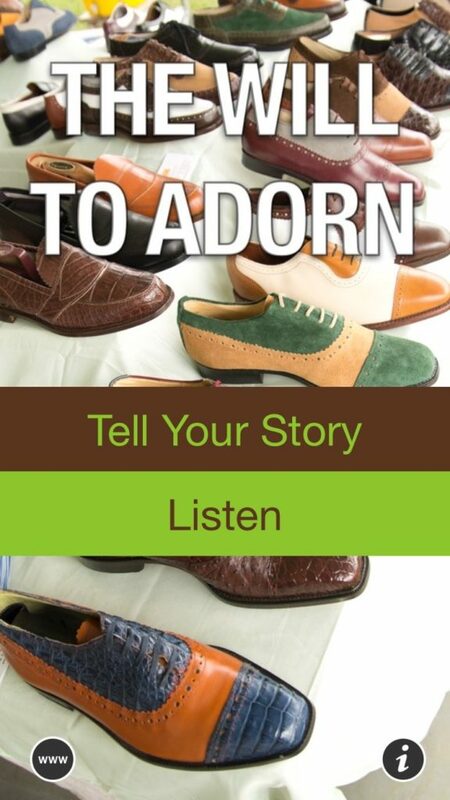 For researchers, the app’s recording feature may, however, allow for a greater understanding of African American cultural expression, through style, connects to specific localities. Lastly, some food for thought: Given its simplicity, how might the app and project be further developed to translate people’s responses to prompts provided onto a map or other methods of displaying “space”? Or, is the app as functional as it needs to be? Thanks for the great post Jonah. I think this is an interest and really worth while project, but it seems to fall in the trend we’ve seen with other sites and projects we’ve examined in class. It seems that many of these projects that have a crowd sourced or public contribution element suffer from being able to get contributors to “fully” contribute to the project and give complete descriptions and fill in all information bubbles etc. I wonder why this is and what can be done to try and aid this issue or foster more quality participation from the publics interested in these projects. From what you’ve described, I don’t know if the app would benefit substantially from a visual spatial component, especially since it seems like the geographic information that the app requests from users is broad (it sounds like it asks only for a region of the country). A visual spatial representation might risk presenting information in a way that allows for a user to draw conclusions that are too broad and do not reflect the reality of the information contained in the recordings.